GLO Science is committed to educating and innovating in oral care, making your smile whiter, brighter and healthier. GLO Science revolutionizes at-home teeth whitening. Awarded Guided Light Optics (G.L.O.) Technology uses heat-plus-light in a closed system mouthpiece, combined with the unique whitening gel formula and G-Vial applicator, to activate and accelerate teeth whitening results at home, without sensitivity. Invented by oral health expert Dr. Jonathan B. Levine, GLO Science harnesses patented technology using heat and light in the GLO Brilliant Mouthpiece combined with the GLO Brilliant G-Vial Whitening Gel - for fast, easy to use, safe, superior results - with no sensitivity. It's time to GLO! To achieve whiter teeth with no sensitivity, reach for a GLO Science kit. 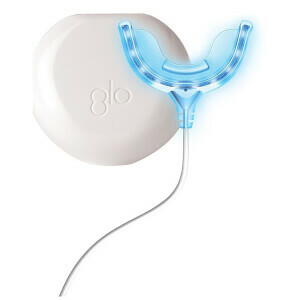 GLO stands for "guided light optic," a patented technology that utilizes LED light and heat resistors within a mouthpiece to speed the whitening action. This innovative, at-home system was created by Dr. Jonathan B. Levine. Dr. Levine is an esteemed dentist and prosthodontist with a practice on Fifth Avenue in New York City. He holds 10 patents in oral care, with an additional 19 patents pending, and he is a featured expert on The Dr. Oz Show. The traditional professional whitening technique - commonly performed as an in-office procedure by dentists and hygienists - includes having a light outside the mouth. Dr. Levine's GLO mouthpiece brings this light into the mouth where it can interact with heat and accelerate the GLO gel's whitening agents. By sealing the whitening environment with the GLO mouthpiece, the brightening happens more quickly. Stains will be visibly reduced and the overall color of your teeth will improve. By following the GLO Science regimen, your teeth can be five shades whiter within only five days. The process is simple and contains no messy strips or uncomfortable trays. Plus, Dr. Levine's GLO Science products don't cause sensitivity, which is a painful side effect of those other whitening products. The GLO Science system simply includes the mouthpiece and a charging unit, as well as the whitening gel and a nourishing lip balm. The company also offers an antioxidant toothpaste and gel refills to maintain your whiter smile.